Picasso was fascinated by puppetry. Evidence of this often appears in his work. 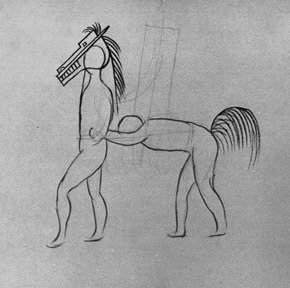 Early examples are his pantomime horse studies for Jean Cocteau's ballet, "Parade," drawn in 1917. These ballet designs provided Picasso with an opportunity to experiment wildly with this much loved subject of the horse, a personal symbol which had appeared many times previously in early scenes of the bullfight and the circus. The pantomime horse reappears in the theatrical context of The Unknown Masterpiece. It doubles as a concealed Picador's horse composed of body parts belonging to the two women either side of the central figure. Into this extraordinary amalgamation, Picasso incorporated an autobiographical pun. 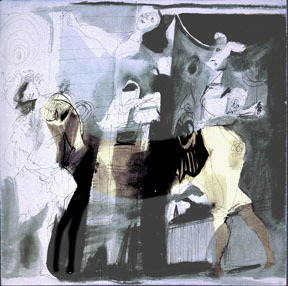 The central figure, Picasso, is riding on the horse's back, whilst at the same time manipulating the two women who embody the horse, by means of puppetry. 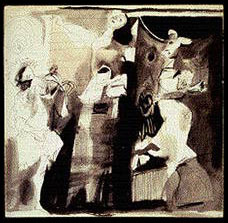 The female on the left, at the horse's head, can be seen as a marionette dangling from the strings descending from Picasso's right hand. The female on the right, at the horse's rear, is a glove puppet controlled by Picasso's hidden hand inside her head. This is also a reference to Picasso seeing himself in the guise of a puppet master, a role which has traditional magical associations.